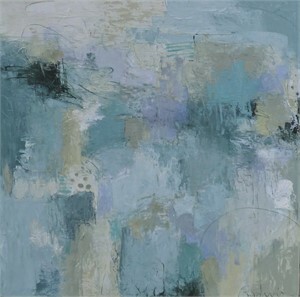 Susan Godwin is an Alabama based painter of abstract and abstract expressionistic paintings. She paints in oils, usually on large canvases. Although Godwin has studied with many artists in classes and workshops, she is primarily self-taught. Her work is held in many private and corporate collections. She paints because of the drive to create. She describes her relationship with painting as fun, exciting, calming, and at times maddening and frustrating. Her motto is ‘nothing happens if you don’t show up. Godwin’s inspiration can come from literally anywhere- from the colors and patterns of the iris blooming in the front yard to the cover of a good book or the mere act of painting can provide inspiration. Her aim is for less thinking, more expressiveness while keeping in mind color relationships and harmony. After these many years she stills find painting a journey of discovery and wants her work to reflect that journey. 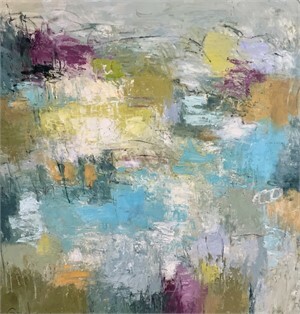 Susan Godwin is an Alabama based painter of abstract and abstract expressionistic paintings. She paints in oils, usually on large canvases. Although Godwin has studied with many artists in classes and workshops, she is primarily self-taught. Her work is held in many private and corporate collections. She paints because of the drive to create. She describes her relationship with painting as fun, exciting, calming, and at times maddening and frustrating. Her motto is ‘nothing happens if you don’t show up. Godwin’s inspiration can come from literally anywhere- from the colors and patterns of the iris blooming in the front yard to the cover of a good book or the mere act of painting can provide inspiration. Her aim is for less thinking, more expressiveness while keeping in mind color relationships and harmony. After these many years she stills find painting a journey of discovery and wants her work to reflect that journey.